We had a pretty quiet weekend for the most part this week. 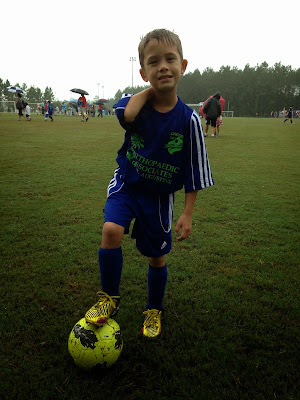 Connor had soccer practice on Friday night and then a game on Saturday morning. It was a rainy game and rained the entire time. We all sat and watched him under our umbrellas. We stayed mostly dry, but Connor got soaked. We asked him afterwards whether he liked a wet rainy game or a hot sunny one and he said he liked playing in the rain. He was a very good sport about it! This week the coaches mixed up the players a bit, and Connor was chosen to play up a level, with the U8 players. He did a great job and held his own with the 7 and 8 year olds. He scored two goals and fit right in with the older kids. We don't know if he will continue to play U8, as the coaches can make changes weekly. I had an enjoyable weekend as I was able to get out and target shoot on Friday evening and Sunday for a competition. Thanks Andrea!